This chocolate brown walnut flooring with a 4mm solid walnut top layer is supplied unfinished allowing for traditional hand finishing on site. 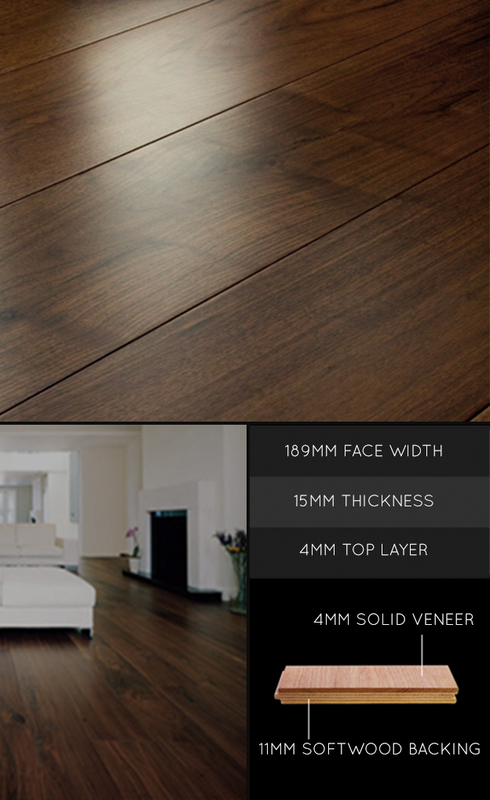 These highly stable engineered wooden floors is constructed by bonding the hardwood top layer to a 11 mm stable plywood backing making it an ideal choice for underfloor heating. Once fully installed our timber floors are indistinguishable from its solid equivalent and do not have the inherent movement problems associated with them. Engineered floorboards can be installing directly to concrete and timber subfloors. Width 189mm x 15mm thickness. • 4mm walnut wear layer. • Eco use of hardwoods. • Unfinished for on site finishing. • Up to 70% more stable than solid. • Suitable over underfloor heating. • Prices exclude shipping @ £80 + VAT. • Samples available on request. • Please enquire for availability.